"Encaustic painting, also known as hot wax painting, involves using heated beeswax to which colored pigments are added. The liquid/paste is then applied to a surface—usually prepared wood, though canvas and other materials are often used. Encaustic artists and candlemakers love our natural white beeswax, many consider it encaustic wax. Our white beeswax is filtered naturally with no chemicals used & highly refined by the Dilco Refining process, a well trusted method of naturally filtering & bleaching beeswax. 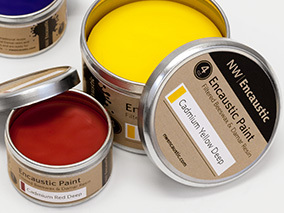 We are pleased to provide awesome encaustic paints from NW Encaustics. NW Encaustic produces encaustic paints made by encaustic artists for artists. Hand milled and packaged at the NW Encaustic studio in Seattle WA & carefully formulated to provide you with highly pigmented encaustic colors of the highest quality. Triple filtered encaustic ensures the clearest medium and cleanest colors. The encaustic medium mixes we offer are 15% to 85% beeswax. We can do custom blending for serious artist only please. WE PROUDLY CARRY PRODUCTS FROM Jack Richeson and Company, Inc. Fine Art Materials. Call 1-888-848-7926 for more info. This is a multi use candle tin w/lid. 4" tall x 3.5" across. Bamboo Muti head brush 4"
Multi Head Bamboo Brush 5242 Series These are bamboo brushes that have a unique ferrule that bonds a series of wool heads together. These brushes are marvelous for different watercolor techniques. Bamboo Reed Pens These old world tools can bring a new look to anyone’s work. Used for writing or adding lines or detail to artwork. Encaustic Paint Burnt Sienna 1 oz Paint made by encaustic artists for artists. Encaustic Paint Burnt Umber 1 oz Paint made by encaustic artists for artists. Encaustic Paint Cadmium Orange Deep 1 oz Paint made by encaustic artists for artists. Encaustic Paint Cadmium Red Deep 1 oz Paint made by encaustic artists for artists. Encaustic Paint Diarylide Yellow 1 oz Paint made by encaustic artists for artists. Encaustic Paint Lamp Black 1 oz Paint made by encaustic artists for artists. Encaustic Paint Naphthol Red 1 oz Paint made by encaustic artists for artists. Encaustic Paint Permanent Red 1 oz Paint made by encaustic artists for artists. Encaustic Paint Phthalo Blue 1 oz Paint made by encaustic artists for artists. Encaustic Paint Phthalo Green 1 oz Paint made by encaustic artists for artists. Encaustic Paint Raw Sienna 1 oz Paint made by encaustic artists for artists. Encaustic Paint Raw Umber 1 oz Paint made by encaustic artists for artists. Encaustic Paint Titanium Buff 1 oz Paint made by encaustic artists for artists. Encaustic Paint Viridian Green 1 oz Paint made by encaustic artists for artists. Encaustic Paint Yellow Ochre 1 oz Paint made by encaustic artists for artists. Large, soft bristle flat top brush. Great for those large projects! Pencil Overgrainer - 9740 Short Natural Harwood Handle Graining and marbleizing consist of applying ground color, and then working in a pattern or marble grain with colors using graining tools. Small funnel for refilling oil candles. We now also offer a slightly larger size funnel for 1.34 Each. It will give you the option in the shopping cart. ***Swan's Candle Making Suplies encaustic BEESWAX SPECIAL*** up to 10 lbs Beeswax shipping USPS Priorty anywhere for $13.45 in 2-3 business days With Deliverly Confirmation. Swans Candles is a private label manufacturer, we can make and label your product for you. Need a custom formula, Swans can make it for you.